This is Trey Jackson. 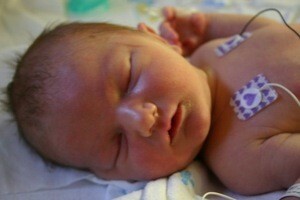 He is my first grandchild and was born February 12th, 2010. He's such a precious little miracle. It's impossible to describe how much we love him and how thankful we are for him. He has been a sick little boy until the last day or two but he is doing much better and the doctor says he can probably come home this Saturday! He's been born into a frugal family that LOVES Thrifty Fun! Just had to share a little photo of him! Congratulations Robin! He is beautiful. You have a precious, beautiful little boy there, and being a "gramma" is the best. So glad to hear he is coming home. He is beautiful! He shares a special day with Abraham Lincoln and my daughter. Congratulations to you and yours. Congratulation! Trey is a beautiful boy. He is a gorgeous baby, Robin. Bet you can't wait to bake cookies for him! Congratulations to you and your family! How wonderful it is to have a grandchild. When we have our babies, we love them so much, and wonder how we could ever have this kind of love again. And then God sends a grandchild! And there is this special love that is between us and that grandchild. What a cutie! I so hope Trey was able to come home on Saturday so you all were able to ooo and aww him in his home instead of a hospital! Prayers for future good health! Congratulations and best wishes to grand mom and baby's family. Congratulations on your lovely grandchild. Our greatgrandaughter/grandaughter had a difficult birth and swine flu was everywhere, so doctor told us to keep her away from people for 8 weeks and to use one drop per day vitamin D [can find many places and store brand will be around 7-8 dollars. One bottle will last a year, and it provides 400 IU per day. She is 6 months now and has had her first cold. Vitamin D is now being recommended for all children at about 400 IU a day, for many reasons. It is the most valuable frugal tip I know for any and all of us. Congratulations Robin, so so happy for you! Congratulations to you and your family. I pray God watches over you all and blesses you richly. May Trey be a healthy child. He is so beautiful. Congratulations! Trey is beautiful and his little personality shining through!